People communicate to show someone how they feel, to share their ideas to tell someone what they need, to ask a question and to socialise with other people. Communication is very important in a care setting because it builds relationships with the carers and the other residents. Communication helps to know how people are feeling, what they want to do and prevents misunderstandings with their care. Working in the care environment you get used to observing people’s reactions like the change of pitch when they talk this is important as this could mean they are angry or stressed out. The body language can alter as well; facial expressions or no eye contact can mean they are unhappy or angry with someone. If these changes are recognised then the situation can be dealt with. Each individual has their own way of communicating like using their own mother tongue, their own cultural beliefs. Their own way of communicating because they can’t talk or hear properly or their own physical difficulties sometimes their age or gender plays a part. We need to know all about these things so we can respond to a person’s needs or wants, whether they are alright or not. Communication methods could be sign language, Braille, finger spelling, tone of voice, body language, pictures or even a translator. Some barriers to communication could be a different language, mental problems, aggression, and lack of confidence or effects of alcohol or drugs. We can help to communicate with people by using an interpreter, a signer, talking clearly and using proper vocabulary not slang. We can remove all distractions by moving into a quiet room which can be light and airy; this all helps to remove barriers in communication. You can find out whether a person has understood you or not by asking questions, repeating or changing what you have said, allowing enough time for them to answer and being aware of a person’s own way of talking with their body. Sources of information and support can be found in the speech and language services, translation services or interpreter services. We can also find help by asking for support off a certain organisation like Stroke Association or the Institute for Deaf People. Confidentiality means not telling anybody else information that you have been given by another person unless told it is alright to do so, this term comes under The Data Protection Act 1998. Confidentiality can be maintained by following policies and procedures in the work place. It is the manager’s role to supply training in recording and storage of any information given which is confidential and to support and guide us when needed. Information might need to be shared if the person is in any danger or at risk of abuse. Information is given on a strict need to know basis and is never taken out of the work place. It is important to follow procedures about confidentiality and tell the person in charge if you discover any procedures are not being done properly. You must have consent off the person before saying anything confidential to anyone else. 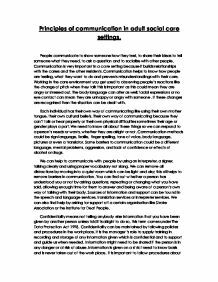 This is an adequate essay but it is missing some of the fundamentals that should be discussed in communication - such as verbal and non-verbal. 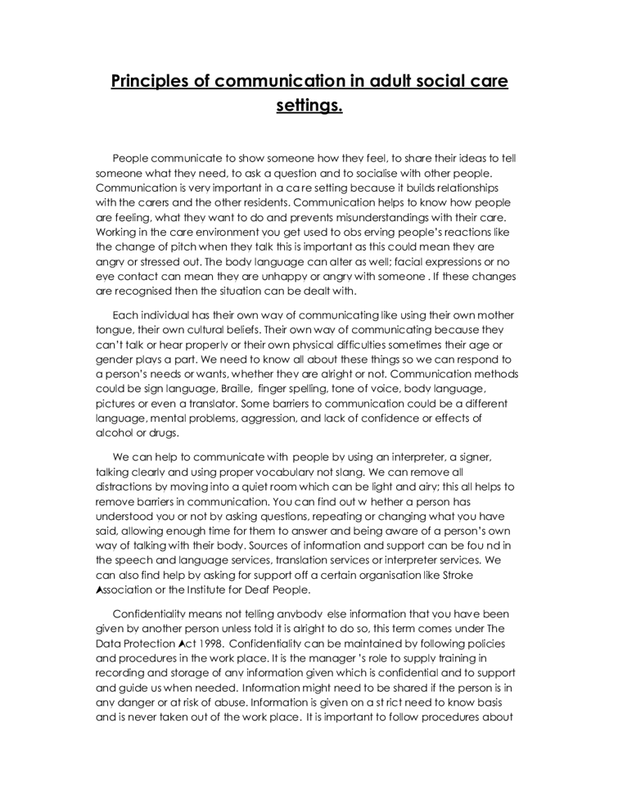 It is a little mixed up and would benefit from a little more research into types of communication beyond just that required to overcome barriers. Four models of disability with barriers and assessing them. This includes creating thoughtful procedures and policies and delivering that information in an effective manor.'' (http://www.ehow.co.uk/how_4600117_stop-discrimination-work-place.html?cr=1)  Peacehaven house managers should require that all care staff read those policies and be there to discuss and answer any questions they may have. noise in order for it to be easier for the service user to communicate. Another resource that is useful when communicating with someone who has a hearing disability or is deaf is the use of British sign language. Sign language helps communication to be more effective for those that cannot hear what is being said. This can restrict the quality of communication. The patient may need to tell the doctor things faster than usual and might not get through everything they needed to discuss. Therefore, the patient may not get all the care they need. If the change is complex, such as using a new building and staff team. Monitoring systems and processes would help assess whether the service is effective in benefiting individuals. Monitoring involves research for example: 2. Using questionnaires to investigate precipitation of individual?s users of a new service. Use the food pyramid for the food choices 2. Chose lean meats and low fat dairy products 3. Saturated fats should not exceed 10% of your calories 4. Base fat intake on the calorie needs How the food pyramid can guide you What is your caloric limit? One needs to have enough calories daily for the body to have all the nutrients it needs.